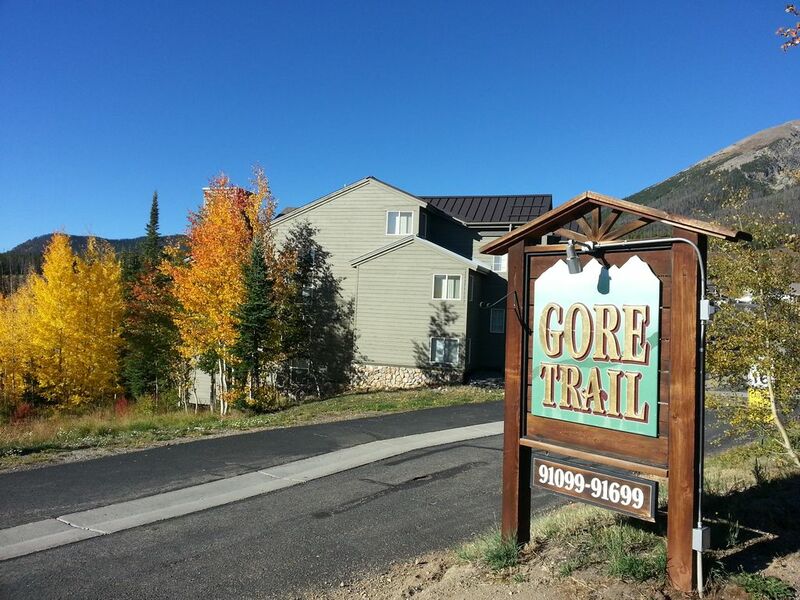 Located at 9700 feet, at the top of the Wildernest Development, above Silverthorne, in Summit County, Colorado. Fantastic views over Lake Dillon to the rest of Summit County. Fifteen to twenty minutes to Arapahoe, Keystone, Breckenridge, Copper Mountain and Loveland Ski Areas. Thirty to forty-five minutes to Vail and Beaver Creek. A five minute walk to the entrance into the Eagles Nest wilderness area for hiking, cross-country skiing and snowshoeing, right out the north exit from the parking lot. Two outdoor hot tubs at the private clubhouse. Built in 1999 with almost 1400 square feet, it has two bedrooms and two bathrooms on the main floor and a bedroom/bathroom loft upstairs. The unit can be rented either as a two bedroom (main floor only, 20% discount) or a three bedroom (with the loft). The main-floor master bedroom has one queen-sized bed. The main-floor guest bedroom has a bunk bed combination with a standard double bed on the bottom and a single bed on top. The loft bedroom has queen-sized bed. TVs in each bedroom, plus the living room. The kitchen is fully furnished. Covered parking, one space, and multiple uncovered spaces available. This is a non-smoking residence. Please note: There is a cleaning fee, and a security deposit associated with each rental. Please ignore the average response time indicated on this web site. While in Europe May & June 2017, VRBO automatically changed my Holiday Season rental rates to the summer rates. Understandably I started receiving inquires for the Christmas Holidays. However VRBO's system did not allow me to access their system from Europe & I could not to respond to their inquiries. Finally I was able to call VRBO and they contacted the inquirers and explained the situation. However my average response time disintegrated from hours to days. And they continue to tell me that they can't correct the issue. I started skiing at age 5 in New England, ski bummed in Aspen the first year Snowmass was open, and two years later spent the winter of 1969-1970 in Chamonix & Innsbruck, back when Europe cost $5 a day. I then got tied down to a software business in Denver until retiring 8 years ago. Beautiful location and wonderful access to 7 major ski areas: Loveland, A-Basin, Breckenridge, Keystone, Copper Mtn., Vail and Beaver Creek. I originally bought the condo as an investment, but I immediately bonded to the location, the skiing, the hiking, the accessibility from Denver and the unit itself. My plan was to sell it after 10 years, but it's been 18 years now and I am more attached to it than ever. Incredible views across Lake DIllon & Summit County. More than a kitchen should have. Living room and all bedrooms. At first we thought the drive up the hill might be to much as a major storm was forecast for the middle of the week. By the end of the week we all agreed, the extra 2,000 ft of elevation was worth the drive for the amazing view. The kitchen was well equipped. And the third bathroom a nice convenience, both in the morning and after skiing when everyone is trying to get ready at once. This group were excellent renters and I was glad to have them. But I feel I need to clarify the phrase "the extra 2000 ft of elevation". I am not sure what that was referring to. The Silverthorne exit from I-70 into Summit County is at about 9000 ft altitude, and the condo is about three miles further and about 500 ft higher. The road is aggressively maintained whenever there is a snowfall and I have added a view of the road to the pictures of the condo. A nice place to spend a girls ski week. This quiet condo suited our needs perfectly. Each of us gals had our own bedroom and bathroom. There was plenty of basic supplies, towels, linens, etc. for us to make it through the week. Parking and entry on the same level worked well for carrying groceries and luggage in and out. The fireplace was very welcome after spending a long, snowy day on the slopes. The view from the dining room and loft was spectacular. We would have given 5 stars except that there was dust that caused a lot of sneezing and stuffy noses for 2 of us. Owner was quick to address this problem. Great experience and stay. Owner was very response to questions and concerns that we had about the place and clubhouse. It was everything we were looking for ! Great place with a majestic view. Nice place to crash and cook dinner. We wouldn't have been able to find the place without calling the owner. Grateful the owner was available by phone to help us. The development has 6 buildings, all in a row, and all entrances are facing the parallel parking lot. My recollection is the first part of the group might have arrived without some of the instructions and pictures, but were more or less standing in front of the building. 10% Discount for stays of 1 week or longer. Can be rented as a 2 bedroom for 15% less than the seasonal 3 bedroom rate.